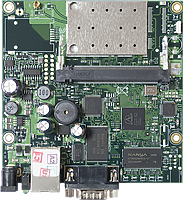 The RB411AR has an integrated 802.11b/g wireless card with MMCX conenctor. Not only you have a readymade wireless solution, but also you have a spare miniPCI card slot for another wireless card. With this device you can connect to a remote AP and serve your local area with internet both at the same time! It has the same familiar footprint as the other RB400 series devices, which means you can mount it into any supported outdoor enclosure, and upgrading to this model will take just minutes.